The Monoprice Select Series battery performs well, has solid build quality, and comes from a company that handles warranty and other issues well. But it falls short among its peers. The Talentcell is a better bargain and weighs 10 percent less though it charges and discharges more slowly. And if you need more capacity, the Anker has double the available energy for about 70 percent higher price, weight, and length. The Monoprice would be a strong contender if it weren’t for the Talentcell, as Monoprice’s entry charged a MacBook to 70 percent in just over two hours, performing well in terms of both speed and capacity. 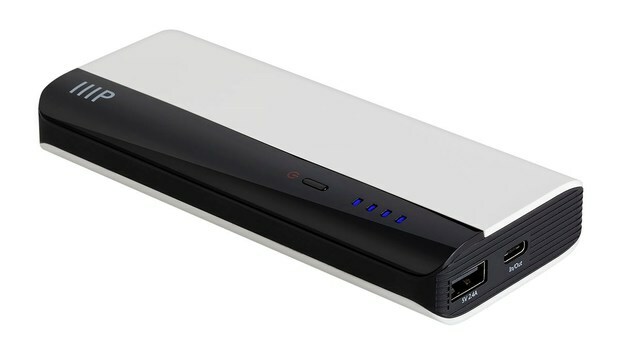 This model has two ports, using the USB-C port for both recharging its cells and charging other devices, although the battery comes with no USB-C cable. It can recharge at up to 2A and like all but the Talentcell charges another device at 3A over USB-C. Its Type-A port charges at up to 2.4A. Both ports are neatly labeled in white-on-black type. Monoprice doesn’t report maximum output amperage but implies it’s 5.4A. Includes Micro-USB to Type-A cable. One-year warranty.